Whether you’re in need of a single gift item or are interested in bulk orders, the King Ranch Saddle Shop has everything you need to show your appreciation and leave a lasting impression with a corporate gift. Start the conversation today by contacting a member of our Corporate Gifts team at corporatesales@king-ranch.com or call 832-551-6057. Create a lasting impression and increase brand awareness with a corporate gift from the King Ranch Saddle Shop. Known for our quality craftsmanship and high-end leather goods, the Saddle Shop has provided corporate gifting options for a number of leading businesses nationwide. Whether you are in need of personalized merchandise for special events, client gifts or rewarding and recognizing employees, our Corporate Gifts team will help walk you through our range of collections and help you select the perfect item for any occasion. Since the earliest days of the King Ranch, the highest standards have been placed on all of our products and merchandise. Constructed of the highest quality leather and hardware available, our bags, briefcases, planners and other accessories are stylish and durable and made to meet the demands of the consummate professional on the go. 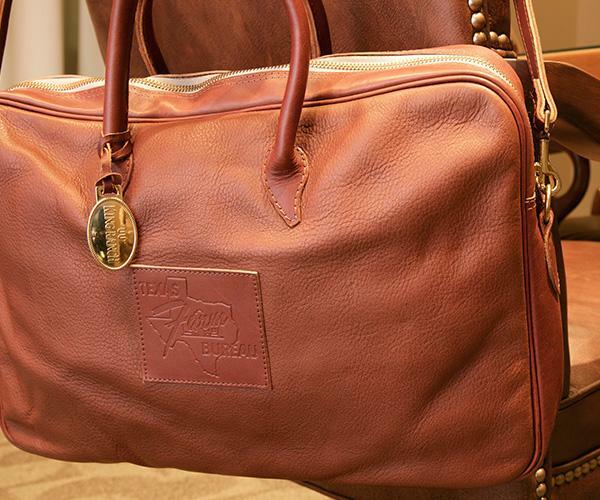 In addition, as a leader in custom leather products, corporate gifts from the King Ranch Saddle Shop have a reputation for being some of the most prestigious items one can receive. Personalize one of our items with a monogram, your company logo or ask about fully customizing your gift to suit your unique business and personal needs. A member of our Corporate Gifts team will guide you through selecting and personalizing the perfect item before our skilled artisans and leather craftsman ensure that your order is beautifully finished with the utmost attention to detail during each phase of production. From conception to completion, our talented team will work hard to help get you the perfect gift items smoothly and promptly. Whether you’re in need of a single gift item or are interested in bulk orders, the King Ranch Saddle Shop has everything you need to show your appreciation and leave a lasting impression with a corporate gift. Start the conversation today by contacting a member of our Corporate Gifts team at corporatesales@king-ranch.com.